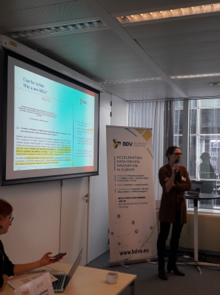 On January 23rd 2019 BDVA organised its 30th Activity Group meeting, which gathered more than 60 participants in Brussels. During the morning BDVA members were engaged in a workshop to provide input to the BDVA upcoming Position paper in Next Generation Data Platforms, Data4AI and the European Data Space. Discussions were enriched by pitches from members sharing interesting ideas and proposals for collaboration. Finally, members were engaged in discussions in relation to the EU coordinated Action plan on AI and in particular actions to support the announced AI-PPP. In the afternoon several parallel sessions took place, covering topics such as Big Data and Smart Manufacturing Industries, Big Data in Media and Telecom, and i-Spaces and DIHs in Big Data. Next BDVA Activity Group meeting takes place in Brussels on February 27th. Interested in these discussions? Join us and join our events.